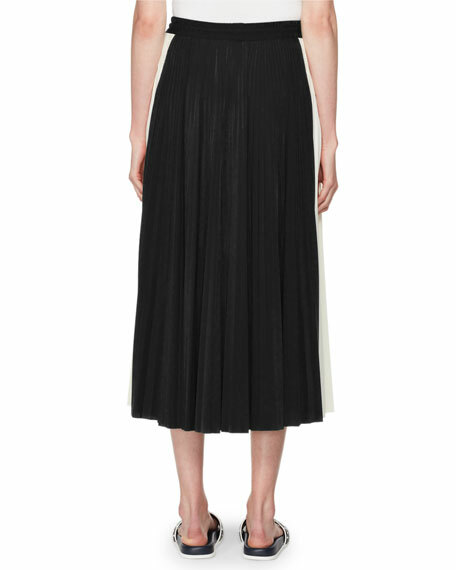 Valentino pleated jersey midi skirt. Akris punto above-knee skirt in soft stretch jersey. Approx. 19.5"L from top of skirt to hem. Mid-rise waist. Fitted style. Akris punto above-knee skirt in soft stretch jersey. Approx. 19.5"L from top of skirt to hem. Mid-rise waist. Fitted style. Back zip. Viscose/nylon/spandex. Dry clean. Made in Romania. Model's measurements: Height 5'10"/177cm, bust 33"/84cm, waist 25.6"/65.2cm, hips 35.8"/91cm, dress size US 2-4/FR 34-36. 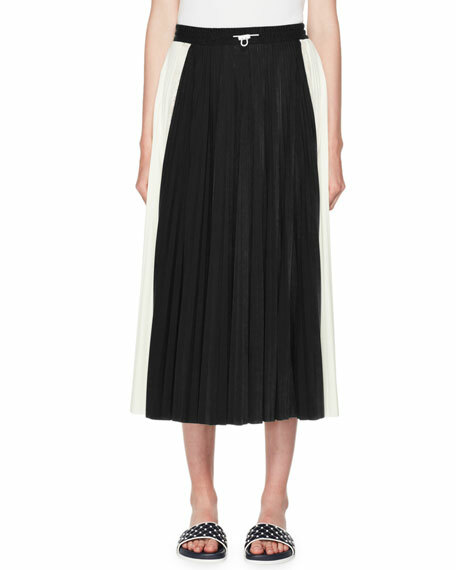 EXCLUSIVELY AT NEIMAN MARCUS La Petite Robe di Chiara Boni "Rodeia" maxi coverup skirt in jersey. Ring detail at left gathers sides of skirt. Full-length side slit. Hem falls to floor. Nylon/spandex. Made in Italy. Model's measurements: Height 5'11"/180cm, bust 32"/81cm, waist 25"/64cm, hips 36"/91cm, dress size US 2/4. Co skirt in 3-D floral-jacquard. Sits at natural waist. Full, A-line silhouette. Hidden side zip. Midi length. Silk/nylon. Dry clean. Co skirt in 3-D floral-jacquard. Sits at natural waist. Full, A-line silhouette. Hidden side zip. Midi length. Silk/nylon. Dry clean. Imported of Italian materials. Model's measurements: Height 5'10"/177cm, bust 33"/84cm, waist 25.6"/65.2cm, hips 35.8"/91cm, dress size US 2-4/FR 34-36.